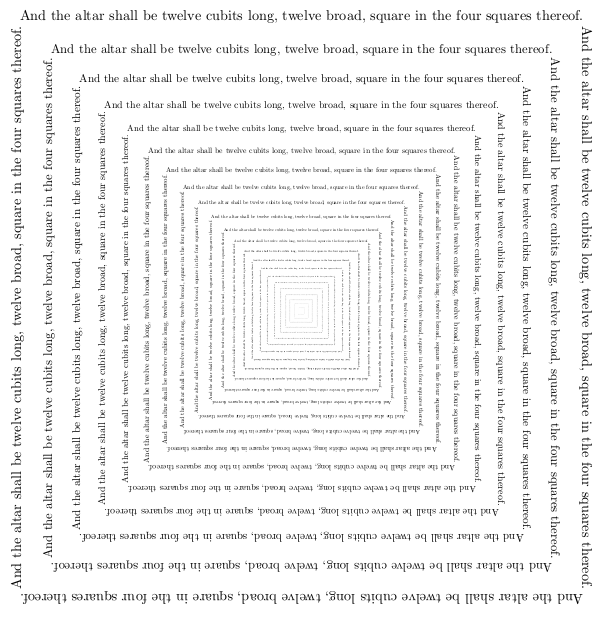 I created a command that makes a square of text in ever-decreasing sizes to create the effect of infinite decrease. But if I increase the starting width, or change the scale factor, TeX has an arithmetic overflow or its memory is exceeded. I wish I had the math skills to understand why this is so. How can I make this more robust so that I could start with any size and change the scaling factor? Update The issue with scaling in graphicx is fixed in the development sources for the next release (probably January 2017) and the issue with the xetex driver discussed in the comments is fixed and already on CTAN. The main issue is that the division macro in graphics was written to do a reasonable job for normal image scaling ranges without using more than a few dozen bytes of code. Basically it fails here. Then you avoid the arithmetic overflow, although if you push it too far you run out of main memory unless you start fiddling with texmf.cnf or use luatex and dynamic memory allocation. Hence if N - 2/l >= 1, all the T's are always > S_0 and the loop is infinite. As 0<l<1, we have 2/l - 1 > 1. Thus the inequality above can be realized only if N < 2/l. And if N < 2/l, then indeed for sufficiently large n, it will be true that (*) holds. Hence the mathematical condition for termination if N < 2/l. However one observes it does work for N=20 and l=0.1: I have not looked in detail but some rounding effect should be the explanation which helps the loop terminate. For l=0.1 I get the code to complete with N=20.05 but it raises TeX capacity exceeded for N=20.06. Similarly TeX capacity exceeded with N=4.01 and l=0.5 but it compiles with N=4. This is all using the \Gscale@div from my other answer. This answer has now four parts A, B, C, D displayed in order C+D, B, A. A: original answer which defines a one-liner replacement of \Gscale@div for dividing two lengths, using e-TeX (and skipping some checks done by original \Gscale@div). I know there is a similar expression elsewhere on this site, which I have hit against recently I recall it was in some post from 2011 or 2012. B: a replacement of \Gscale@div which does not use e-TeX facilities and is written using the usual scratch macros and registers of LaTeX. The computation is guaranteed not to create overflow if the (rounded) result is at most 16384 - 2/65536. As discussed below, when the divisor is at most 0.5pt a truncation, but when it is at least 0.5pt a rounding of the exact ratio is done to an integer multiple of sp unit (=1/65536). For people wanting rounding in all cases for coherence, see part D.
C: here on top, a \divdef macro for dividing two TeX dimensions, with no restriction whatsoever on the size of the result. Initially I wrote it starting from B and with dividing counts in mind, but as the result is a fixed point decimal with up to five digits after the mark, and as the only way to use this as input in TeX (natively, with no extra lines of code) is to consider it as a dimension (in pt, usually), in the end I again assumed the inputs to be dimension resgisters or specifications (the \setlength part is dropped --- and its overhead when calc package is used --- as this is written for being usable in Plain too.) This can be used directly in Plain TeX. The \divdef macro is a very small variant of the \Gscale@div or part B, which exploits the fact that the latter separates the integer part from the decimal part (but some pieces of the code use operations on counts where \Gscale@div of Part B uses dimensions). I hesitated about again using \the on a dimension to do the final conversion to decimal writing, because it could be handled otherwise, but then one would have to worry about recovering the same rounding exactly as TeX would do via \the. The ratio R is computed as the nearest integral multiple of 1/65536 (ties go to even; but see next item for more precise description) and then (its fractional part is) converted to a decimal number via TeX's \the. D: actually the code in C and B has two branches; the above description about rounding applies when the divisor is >0.5pt. For a divisor at most 0.5pt the fraction is truncated, not rounded, to nearest multiple of 1/65536, before conversion to decimal expansion via \the. Thus in part D, the code is modified to always do the rounding, with ties go to even. I hesitated about this because TeX's \divide truncates rather than rounds. On the other hand e-TeX's / operator (which allows only integral divisors, by the way) rounds (which is a cause of annoyance sometimes), but it rounds away from zero, not obeying the "ties go to even" rule. Note 1: naturally the 4 or 5 decimal digits are illusory precision when the integer part is large, in the sense that the dimensions we divide may have already incorporated roundings of a much lesser precision. But it is the mathematically precise result of evaluating the ratio of the integers which internally code the two dimensions as integral multiples of sp unit. Note 2: as the result may (largely!) exceed \maxdimen as a multiple of pt unit, the code in C and D should set a flag to tell when this is the case, so that subsequent routines can make decisions based on that. 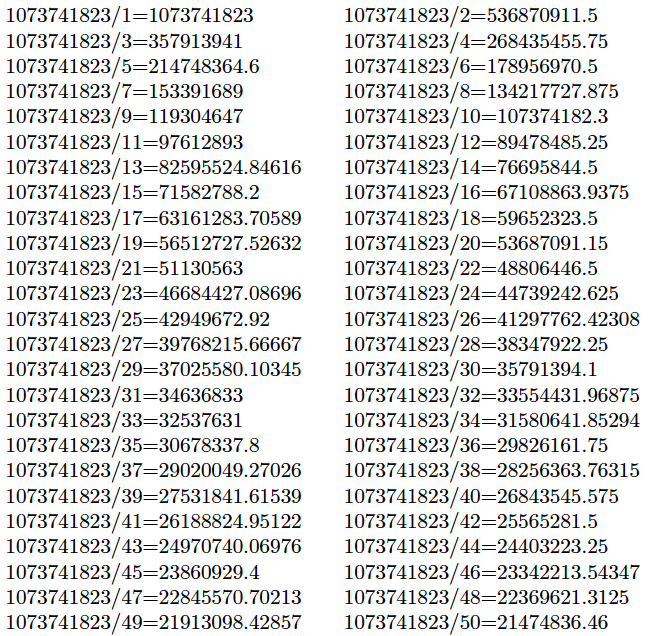 TeX prints 0.29999pt, which is coherent with what one observes below for example in case of division of \maxdimen by 10. This is due to the fact that the code below truncates the exact ratio when the divisor is small (at most than 0.5pt). In both cases an interesting issue is illustrated by 1073741823/37. If we go straight to decimal expansion (without the intermediate rounding/truncating to an integer multiple of 1/65536) the correct fractional part is .27027... (and is barely bigger). But because of the intermediate step either as in Part C or in Part D code, we end up with .27026 as fractional part. 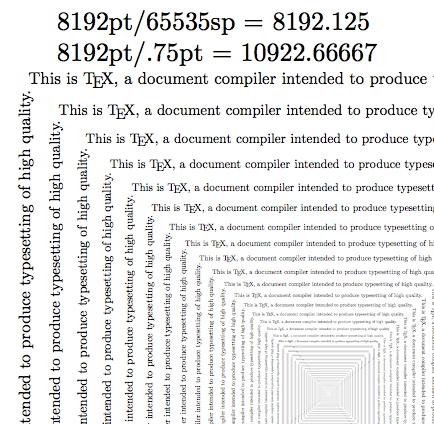 % after decimal mark the last job being made by TeX's \the. % the result put into #1 has no decimal mark  either. 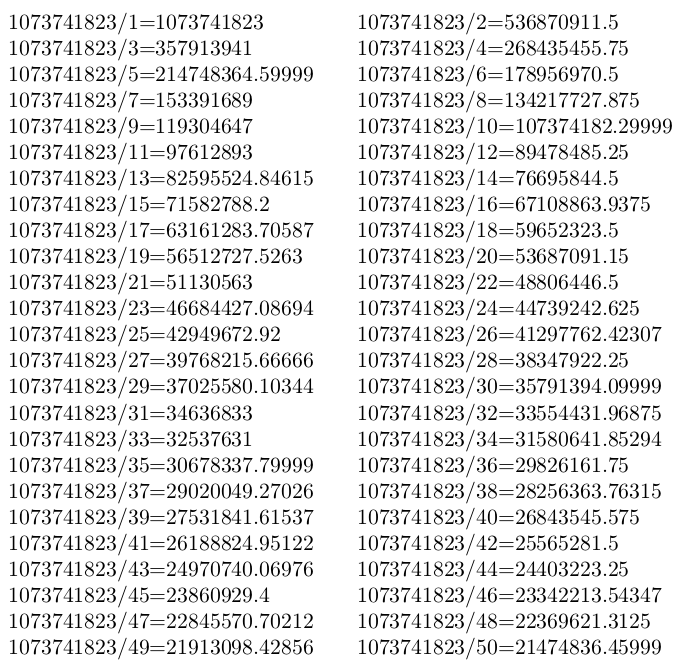 % to nearest integer multiple of 1/65536 (before decimal conversion). \let\ddf@sgn\empty % no \@empty in Plain ! \advance\count@\ddf@cnta % not same order as in previous branch! % in case of a tie at the last unit the rounding was to even! % implement "ties go to even", the rounding was "up"
% despite the rounding this branch always produces \count@ < 65536. Here a pure Knuth TeX (*) approach to make a macro doing the precise computation with guarantee of no overflow (if rounded theoretical exact value is at most 16384-2/65536.) 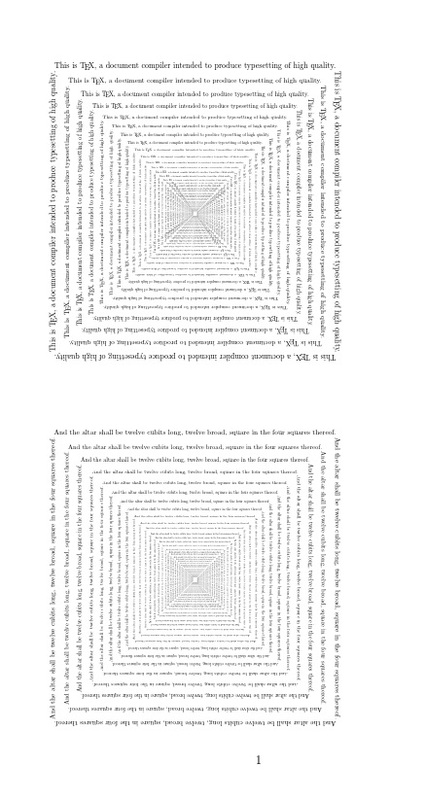 I tried to follow the style of LaTeX and graphics.sty in using macros and temporary registers. (*) the \loop must like the LaTeX one allow \else\repeat construct. \@tempdimb\@tempcntb\p@ % integer part of ratio. Naturally, may overflow! \dimen@ii\@tempcntb sp\relax % now num<denom. No \@sp like \p@ ? \advance\count@\@tempcnta % not same order as in previous branch! As an alternative with no package, you can define \Gscale@div using e-TeX facilities. % are lengths (registers or expressions). % number with about 4 or 5 digits after decimal mark. Not the answer you're looking for? Browse other questions tagged macros loops lengths fun memory or ask your own question. Why does the following code run in an infinite loop?